Lois Winston is pretty amazing. 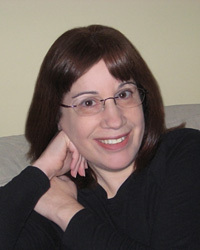 she also writes wonderfully light romances, romantic suspense, and contributed to a guide to the TV series, House. Her books have won a slew of awards. If you’ve ever done a needlework pattern out of a magazine or craft book, you’ve probably done one of her patterns, too. Besides all that, she’s an author’s agent who shoots straight from the hip. It sounds lethal, but finding someone who’ll tell you exactly what the state of the market, or your manuscript, is can be rarer than finding an honest politician. To be frank, there is little that Lois Winston can’t do. She sat down with me to do a video interview — and it was really great. We laughed — well, she was hysterical, and I did the laughing. I played it for several friends right off of my camera and they all said it was one of my best. But as I went to upload it recently — and it was much, much overdue, but with the death of my father I’ve been awfully behind in things — that polar vortex that has been freezing all of us sent ice skittering across my electric lines. The power went out, the video got corrupted, and I am here, asking Lois to forgive me. While I beg for a second chance to interview her — and hopes she understands –here is a link to her latest book — one that I know you’ll love as much as I already do. I will not be accountable for what comes up or out if I’m upside down, guys. Take pity on the poor girl! Are the rest of you listening? Thanks, Brenda. Water torture is the ticket! Hmm, with readers like you, who needs enemies! Besides, I’m like a cat, I hate getting wet. LOL. Nah, tickle her to death. LOL. Oooh ooh, not the dreaded tickle torture treatment!!! Aaaaaaahhh. Running wildly away. Diana has wonderful video interviews. I think Lois should forgive her and redo it. I for one, look forward to seeing it. Now, that’s a great reader! Thanks for the support, Cassie, and the compliment. Once upon a time, many years ago, I was hired to attend a trade show and write a report on what was new and on the horizon in the way of products and the state of the industry as seen through the eyes of those exhibiting. I diligently took notes and transcribed them each night back in my hotel room, tossing out my scribbles after inputting the info into my computer. When I arrived home, I turned on my laptop to write my report. Or tried to. Something had happened to my computer. My hard drive was fried. And I hadn’t backed up. I had to recreate all my notes from memory in order to write the report. So I totally understand what happened to Diana, and she is definitely forgiven. Hopefully, we’ll meet up again in the not-to-distant future and can shoot another video. Whew! Thanks for being such a great sport, Lois. And I definitely want to do that video again. Ugh! That should have been “not-too-distant future.” I really do know the difference between to, two, and too! I think a hundred lashes with a wet noodle is in order. After all, she told us how funny the video was but doesn’t want to share. It was hysterical, Linda. Lois is, as I hope you already know, very funny. But, she’s promised me a reprise, so we should have it up again sometime this year. Hmmm, I’m on a no-carb diet — are those wet noodles going to add pounds? I’m sure she will be forgiven — and she should have to re-read all of the books! Ooh, that’s the kind of punishment I like! What could be more fun. Thanks for stopping by, Lynn. The computer gremlins should be blamed! Or maybe the polar vortex… Alaska and Canada? Except they have enough trouble with avalanches due to the unusually warm weather. I enjoy the crafting mysteries and would love to get a copy of the next one. I’m not always a fan of cozies, but Lois is funny without being overly cute. Yup, that was it, Kris, the polar vortex gremlins. Thanks for visiting, you’re entered for Lois’s wonderful book! Redo the interview – live. I want to be in on the laugh session. Wouldn’t that be fun, Judy? We wouldn’t need a laugh track if all of you were there. So glad you were able to stop by! I believe your excuses are valid and you definitely should be forgiven! We are in the polar vortex here as well, alternating snow and cold. Can;t wait for Spring! Gosh Morgan, I don’t think I’ve ever been this cold in my entire life. Glad you mentioned spring — I was beginning to think it a fantasy my brain had concocted. LOL. Thanks for your support! Oh Diana, you have my total sympathies! I once lost a 30k wip to a fried motherboard. You’re an amazing writer and the proof is that you wrote such a great page here, full of links and info, and stuff, that I want to go out and grab a bunch of Lois’s books even without the video inspiration! Ha ha, Chavie, I think you must be right! I know you will enjoy Lois’s books. Thanks so much for stopping by. I vote for the video redo. Polar vortex begone!! Thanks Barbara! I’m glad that Lois agrees. I want to thank Lois Winston for being such a good sport and for always being frank with me. I also want to thank all of you for visiting and thinking up such brilliant punishments. LOL. And a special thanks to those of you who went to bat for me saying I shouldn’t be punished at all. Now, with out further ado, the winner of Decoupage Can Be Deadly is: Chavie! Please contact me within ten days so I can get a copy out to you. Previous Previous post: Manda Talks Location, Location, Location!